If you need to create a business plan, it will be easier to understand, for your client, if you illustrate it as a workflow diagram. With Yaoqiang BPMN Editor, you can draw your diagram in a few minutes. The software allows you to insert numerous shapes, connect them in various ways, add annotations, run a simulation and much more. Yaoqiang BPMN Editor takes up only 3 MB of your disk space. After downloading the software, you can run it right away, without going through an installation process. This means that you can take it with you, on a removable memory device and use it on any computer. You can start drawing your diagram immediately. Yaoqiang BPMN Editor is a comprehensive and reliable software solution whose main purpose is to allow you to create business diagrams, that can be used in a variety of situations, like presentations or conferences. The application is fairly simple to work with, requiring no installation process, so you can launch it immediately after download and begin using it right away. It offers a simple and intuitive interface, making it very easy to browse through all its features and functions, in order to better determine how to use them. Yaoqiang BPMN Editor supports drag and drop, providing you with various 'Elements' and 'Fragments' that can be added to the diagram, edited, moved or deleted. After adding a new item, you can edit the contents of each object (the title or name). Moreover, you can add from the library of 'Elements' various icons representing an 'Organization', 'Organizational Person', 'Conversation', 'Message', 'Group', 'Data Input', 'Data Output', 'Event Gateway', 'Transaction Sub-Process', 'Manual Task', 'Task', 'Service', 'Business', and many more. The 'LDAP' section enables you to create 'Connections'. 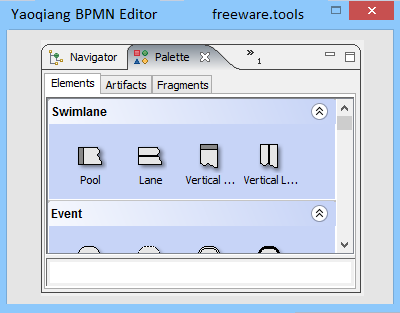 Yaoqiang BPMN Editor allows you to set the preferred 'Alignment', 'Size' and 'Distribution Type', along with the 'Font', 'Color', 'Style' ('Bold', 'Italic'). You can insert 'Definitions', 'Namespaces', 'Imports', 'Messages', 'Errors', 'Signals', 'Escalations', and countless other objects. Once you have completed your diagram, you can press on the 'Run' button which will display the process flow, by emphasizing each element at its proper time. You can 'Pause' it, if you feel you need to give supplementary explanations to your audience, for instance, or stop it completely. To conclude, Yaoqiang BPMN Editor is a useful and efficient program designed to help you generate advanced graphical diagrams for business purposes, enabling you to save the file to a variety of formats, such as BPMN, JPG, SVG, XML, WBMP, ODT or BMP.